Turns out that Microsoft kind of lied when it said the browser is Windows 10 exclusive at the launch date. As first spotted by Bleeping Computer, the Windows 10 Edge installer also works Windows 7, meaning you can download and install the Chromium-based Microsoft Edge browser on your Windows 7 PC. The only catch here is that you won’t be able to download the installer from Microsoft Edge website. Therefore, to taste the Microsoft Edge browser on your Windows 7 PC you have to download the installer from a Windows 10 PC, and then make a copy of the installer file, paste it to your Windows 7 PC. Follow the necessary steps and your attempt of installing the browser should be a success, you’ll also be able to use the browser and there shouldn’t be any issue with surfing the web. However, if you try to watch your favorite TV series on Netflix on Microsoft Edge browser then you are out of luck. Netflix will display an error message right after you hit the Play button. Now since it’s not an official thing you might face other issues with the new Edge browser on your Windows 7 PC. Are you still planning to give it a shot? 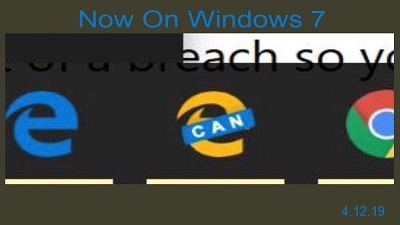 You can download the Developer or Canary builds without going to the official Microsoft Edge website.